"Language can be turned into data, and used to solve particularly thorny global problems." The world is awash in data - most of it numbers. Our geo-tracking, behaviour-monitoring mobile phones generate new swelling heaps of data each day, not to mention the hoards of data that accumulated for decades through traditional commerce and the simple fact that more people started using computers. Industries have sprung up around generating data. More have sprung up to help analyse it. But floating along in this sea of data is language, arguably the most important way in which humans make sense of the world. For evidence that language still matters, look no further than America’s current presidential race. The two parties’ frontrunners, Hillary Clinton and Donald Trump, have very different speaking styles – something nearly every pundit remarks on. But in March, an Ohio State University scholar argued that Donald Trump’s language could actually win him the presidency, since candidates who use more emotional words get more votes in times of instability. The Washington Post took the idea a step further, arguing that the very structure of Trump’s sentences – which work more like punchlines than traditional political rhetoric – are one of the most important components of his popularity with voters. Interestingly, language can be turned into data. How many times was a keyword used? Are those mentions up or down versus last week? But linguistic analysis of this sort misses a critical component: context. Is the word being used by an individual, publication or company – or one million individuals and companies? What else was said around it? Language analysis that also includes context can not only clear up confusion and add insight but can also be used to help solve particularly thorny global problems. Last year, the United Nations identified four countries – India, Pakistan, Nigeria and Kenya – with a high resistance certain vaccines. A traditional approach to tackling this problem might involve examining resistance rates in the countries, then mobilizing a ground team to run surveys or talk with doctors and clinic workers in the worst areas. But the UN’s Global Pulse project partnered with Quid, the software firm I founded and that searches, analyzes and visualizes the world’s language, to take a slightly different approach. 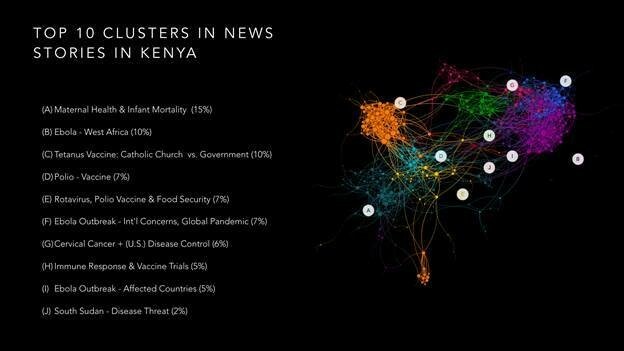 In Kenya, Quid analyzed nearly 1,000 news articles and other documents, identifying topics around vaccination that raised red flags. Beyond vaccine stats, we looked at Kenya and wanted to know: What is the dialogue happening around vaccines? What are people thinking and feeling about the issue? We analyzed nearly 1,000 news articles and other documents, using language to help identify areas of the dialogue that raised red flags or needed attention. For example, we found that direct government messaging about vaccines was only addressing certain areas – like maternal health and polio – and not urgent issues like Ebola. The UN essentially used Quid to identify pain points so that aid organizations knew exactly where to step in. Language, in the end, is much more than data. It is in fact more like a technology itself. Words and language are so integrated into the way we think that it's hard to imagine existing without them. But as we move forward, the effects of computing and analysis on language will be monumental. Linguistic analysis, unlike numeric analysis, stands to fundamentally change how humans communicate. It can also broaden what we know about how the world works – or doesn’t – and give us more sophisticated tools to help fix it. For more information on the Technology Pioneers 2016, visit our website.